MSC Mediterranean Shipping Company through its freight operator Medway in Iberia, is making a significant investment in the construction of Portugal’s largest dry port to address the growing needs of exporters and shippers in the north of the country. The Lousado terminal will have an estimated area of 200,000 sqm and storage capacity of 10,000 TEUs. Its six rail lines will be of a European standard of 750m each, serving 12 to 14 trains per day. It will increase the use of electric railways compared to road, and hence have a positive impact on traffic congestion and CO2 emissions, thus providing a more sustainable mode of freight transportation. 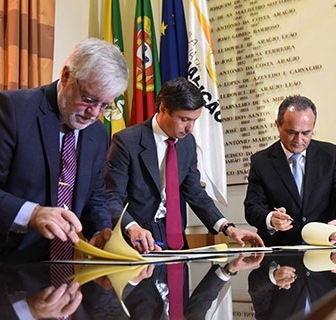 The project is proceeding with the cooperation and support of public institutions, such as the local City Hall of Famalicão and Infraestruturas de Portugal (IP). Portugal is planning major infrastructure investments to enhance rail connectivity, including 19 rail projects with a total budget of 4.1 billion euros. The new terminal at Lousado will be connected to the national rail network and the main corridors to the port of Sines, and would allow for trans-border service connecting the Iberian Peninsula to the rest of Europe. Construction will begin as soon as the required licences have been approved and is expected to be operational by March 2020. The terminal will be equipped with the most modern technologies, such as state-of-the-art lifting equipment, and is estimated to create more than 90 direct and indirect new jobs.